Today is our non race day as even though there is a sprint race no buses are running to and from the event. So instead we are all going to go exploring round Asiago with a long run thrown in the mix also did house / flat keeping jobs including blog posts. 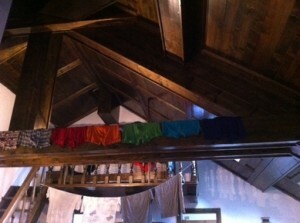 We also decided to do our washing! As we have all been putting it off apart from Becky and Helena who have been very diligent. Now most of us know how to hand wash right? Plug up the sink, put a small amount of washing power in with hot water, then add clothes and scrub, knead and wring them until you have turned the water cloudy/ got the grime out of your clothes. then empty the sink, fill it with clean water and rinse the soapy water out of the clothes. Then wring the clothes out to get ride of as much excess water as possible. THIS IS HOW MOST/ NORMAL PEOPLE HAND WASH CLOTHES! However I have now learnt that Shamgross, Ed and Cameron don’t fall into this category. Firstly Shamus tried to tell me that the best way to hand wash clothes was through wearing them in the shower, then rubbing yourself with conditioner as this gave a perfect wash and made the clothes smell lovely! The next step is to dry yourself fully clothed then undress and arrange your now conditioner cleaned underwear in rainbow lines hung from the rafters. Here is his arrangement of washing is currently instructing the rest of us how to do the same thing. Now lets move to how Cam thinks things dry. See in the photo above the series of t’shirts hanging, Well these until about 10 minutes ago were dripping onto the carpet (and occasionally our heads) as he had basically taken them straight out of the sink and hung them out believing that no wringing out was needed! The joys of communal living, as Becky put it, are endless here. I would also like to comment on the on going series of beautiful quotes from their wisdom of house keeping and extremely well informed (i.e. ignorance of life) knowledge. We girls are continually learning new things and are often apparently “enlightened”. I will end with this photo of Shammers (here he is midway though one of his washing cycles) which gives insight into life here with us.